The Library has an impressive collection of books, journals and other materials that support the University's research, teaching and learning programs. about 480,000 volumes of serials (such as journals, magazines and newspapers). Our collections are spread across our subject libraries, Special Collections and the Library store. Our electronic resources, including journals, databases, Unit Readings and past exam papers, can be accessed from the UWA network. Selected electronic resources are available for UWA staff and students to access from outside UWA. When the University was founded in 1913, the Library was allocated #2000 and held a few hundred books. In the History of the Collections of the UWA Library, 1913-1999 (available on request from Special Collections), Dr Emma Hawkes traces the subsequent history of this collection, examining how the library system has developed and how particular collections have been established. 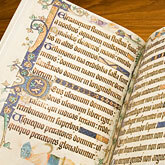 The manuscript of A.B. Facey?s A Fortunate Life and a selection of medieval manuscripts are among the highlights of the Library's special collections. The collections are particularly strong in Australian literature, maritime history and shipping but also cover theatre, medieval European history and theology, early modern European literature, and Indian history. planned, selective development of the collection. The policy is the subject of extensive discussion. It embodies commitments between the Library and the University regarding the responsible and effective use of funds for information resources, and from the faculties regarding selection of materials for required subject areas.